Check out the awesome mural made Open Space Church artists Citizen Klown, Eroe, Arsin, and Boer at the March 31 live graffiti art show here in our parking lot. The theme was “faith and art”. Pastor Roger Pierce will be joining us on Sunday, April 28th for a free lunch, workshop for kids and adults, and presentation on faith, art, and poetry. It will start around 12noon, after the 10:30am worship service. Everyone’s invited, all ages. Roger will also be giving a special presentation on May 2nd at 6:30pm here at Lord of Grace on his faith and art and share some of his story in how they all intertwine and led to spiritual growth. Both events are free and open to everyone. Come to this free workshop on March 5th at 6:30pm by veteran Tucson artist Barb Mulleneaux. She will be leading us in a presentation on her life, faith, and how her art influences and strengthens it. There is also opportunity to explore some creative activity yourself. Check out her art at her web site. This spring, come and learn about Faith and Art. Sunday events after the 10:30am worship (around 12noon) for families and kids. Pot-luck lunch, art lessons, and creative activities for all ages. Mid-week seminars and workshops from professional artists in the community for adults. A live graffiti art show. 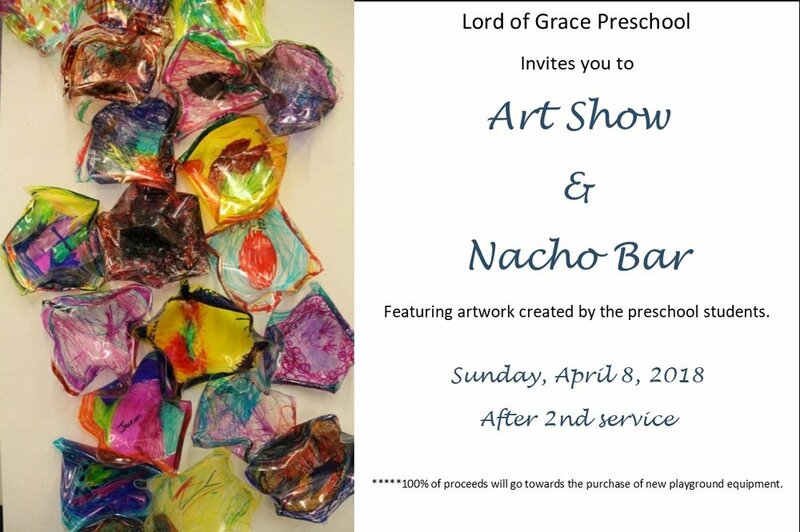 Art show by the Lord of Grace preschool kids, with fundraiser lunch. See below for specific dates and times. All events are completely free and open to the public. Bring your self, your kids, and enjoy some great art, make something yourself, or learn about how artists have found a deeper faith through their creative work. Art workshop and talk with Lutheran artist Barb Mulleneaux. Barb is a lifelong Lutheran and former director of Art for Heart at Resurrection Lutheran Church in Oro Valley. She runs her own business, Barbara Mulleneaux LLC, selling paintings and teaching lessons. Her specialties are plein air painting and pallet knife. All family art activity, pot luck - Guest Artist Nancy Bautzmann. A career painter of extreme-realism, graphic artist, former president of the Pittsburgh Art League, and instructor in children’s art programs, Nancy brings her perspective on faith and art to Lord of Grace. Join her March 10th at 12noon for interactive workshop, art activities for children and adults, and stories of creativity, art, and faith. Michael Schultz is a veteran urban and graffiti artist in Tucson, having worked in spray paint for years with tagging and murals. He is currently one of the leaders of Open Space Church – a new church plant of the ELCA in mid-town Tucson with an outreach to urban young adults and artists. His works have been featured on San Juan Bautista Lutheran Church in Tucson, Reformation Lutheran Church in Las Vegas, and is a regular contributor to the Tucson Hip Hop Festival. See art made by the kids at the Lord of Grace preschool showcased in the fellowship hall. Come to the 10:30am contemporary service and hear them sing in worship, and stay after for a fund-raiser lunch hosted by the preschool teachers. More information on specific days is coming. Some pictures from our preschool art show on April 8th. Our teachers came up with some great ideas for crafts, and our kids showed all their talent. Join us April 8th at the 10:30am contemporary service as the kids from the Lord of Grace preschool sing. Then, after the service meet us in the fellowship hall for a fundraiser lunch and a show of all their recent art.